The plot is a 0.75 hectare (getting on for 2 acres) field on the Eastern outskirts of Chellaston, a suburb on the southern edge of Derby. I like the fact that the plot is less than 1 mile from the shops and other facilities in Chellaston village and offers easy access to the A50 and the wider road network around Derby but yet it’s in the middle of fields and feels much more like a rural than a suburban location. A newer image is shown below. There are hay bales in some surrounding fields (outside the frame of this photo) so it must be from summertime. 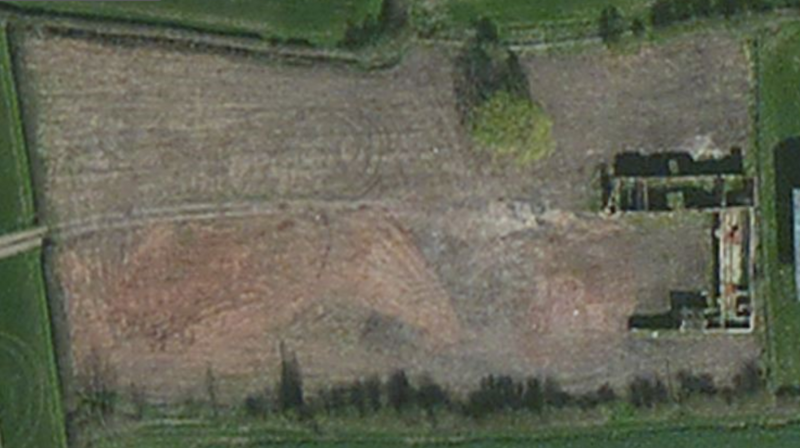 The old farmhouse has been demolished (though the foundations are visible) and the plot looks fairly green so weeds have had time to establish after the whole plot was cleared. There is no static caravan, which means it’s before March 2014. However, there are some paths mown in the weeds which means it was after I bought the plot. 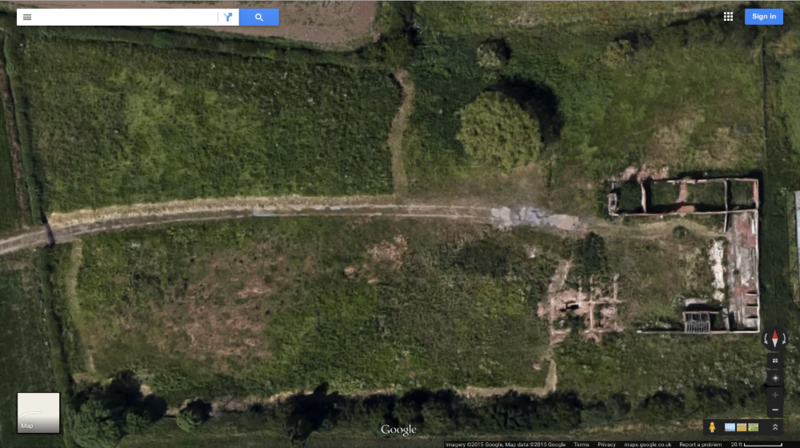 I reckon it must be summer 2013, after I had dug down to expose the foundations of the old farmhouse. A further update, spotted in March 2017, shows the status around September 2016 – after harvest but before the surrounding fields were ploughed and re-seeded. 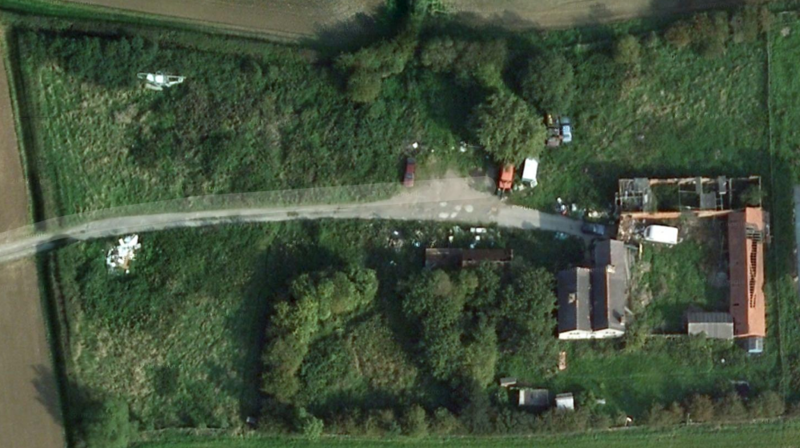 The current view from Bing Maps (as of August 2015) shows the site between the dates of the two Google images – after the old house had been demolished, the rubble cleared and the whole site had been scraped clean. Assuming the house was not demolished until after the planning permission was granted to replace it (June 2011) this is probably early in 2012. By summer 2012, when I first went to view the plot, it was already somewhat overgrown. 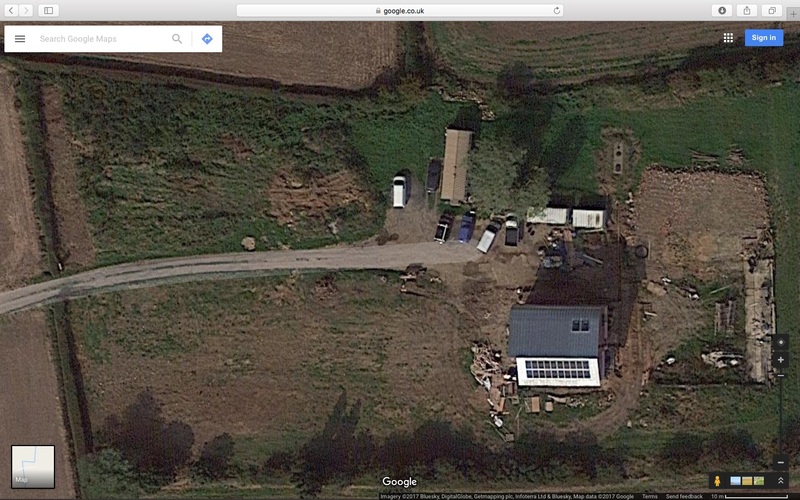 The Plot by Marsh Flatts Farm Self Build Diary is licensed under a Creative Commons Attribution-ShareAlike 4.0 International License. Finally go around to having a nosey on your web site. Will be interestng to see photo’s of progress, in particular house design. I enjoy watching Grand Design when given half a chance.